With three time scales and two voltage inputs levels, the Waveform Viewer Scope is capable of measuring frequencies from 1 hertz to 15 kHz and voltages from 100 mV to 10V. It also includes an adjustable voltage offset for true AC voltages, yet operates on a single supply. 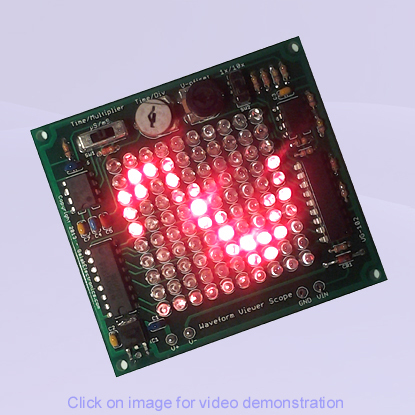 With a 100 LED high intensity display and lots of adjustments, this kit is a great educational tool and a must have for electronics students, hobbyists or amateur engineers. The unassembled kit includes instructions (including schematic and parts placement) and all the components to build one complete Waveform Viewer Scope. A soldering iron, solder and a pair of cutters are required for assembly. User selectable time scale from 120mS to 6.5µS with 3 ranges and time scale sweep control. Scan rate of 150k samples per second for effective maximum frequency of 15kHz. Operates from a single supply and can even be powered off a single 9V battery. Two voltage scales and a full range voltage offset allows measurement of AC and DC signals. Wide input supply voltage from 9 VDC to 24 VDC and a maximum supply current of only 28mA. Please feel free to contact us if you have any question about this project or any othe Galak Electronics Projects. Copyright © 2013 by Galak Electronics. All rights reserved.